Situated right at the long of this alley, away from noises. Except for the dogs in some house that kept barking at us. Our home for the next 4 days 3 nights! 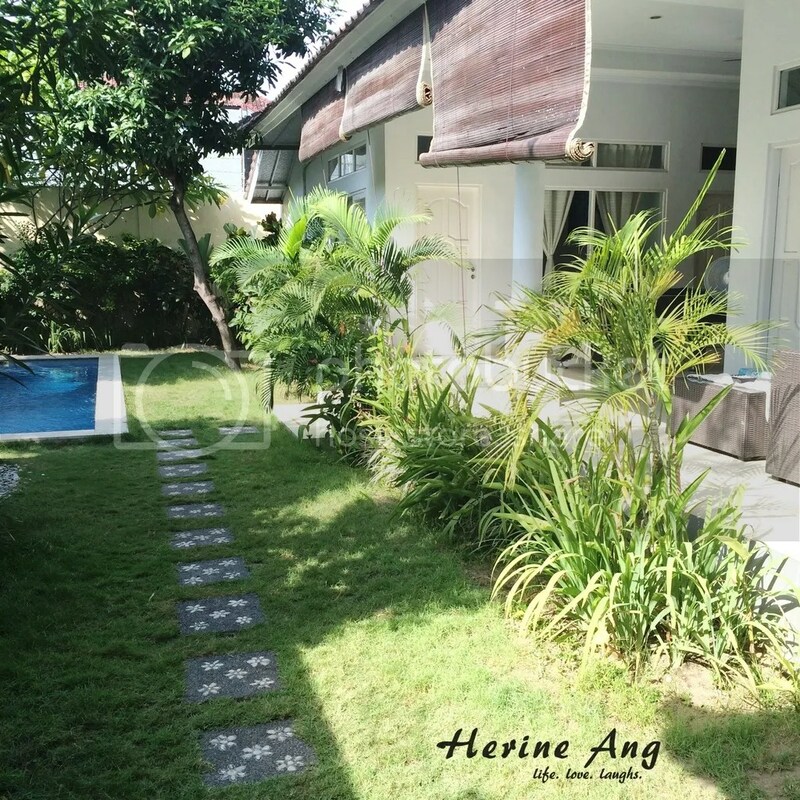 The villa is very spacious -built on an area of 400 square meters. It offers rooms with king-size bed and a private bathroom. A very comfortable couch/chill out area facing the pool. A pool that’s just nice for all of us. Most of it is shaded from the sun so it’s great for those who didn’t like to get sunburnt or too tanned. THIS is why we just have to book this villa! A pool table in the living area! Our entertainment is more or less covered! Whee! Play some music while chilling out or over some games! Dining table great for 6. There is even a water dispenser to keep ourselves adequately hydrated throughout. The kitchen includes everything you need in order to be able to feel at home. We even did some light cooking in the kitchen. The bed that drowned me in sleep every night there lol. I slept like a baby! Because we were so entertained, we didn’t even watch TV. My room has the biggest bathroom! The rainshower is behind the pillar. Not a fan of bathtubs and especially when this bathtub needs some serious scrubbing/cleaning. The outdoor bathroom concept brought me closer to nature, flies and lizards. AHAHAHA. Winnie brought a float and Lennon gave it some serious CPR! My 11th pisces bestie and I enjoying the sun and the water. I can be in the water the entire day! Not forgetting my “hairstylist” job! Let me sum up the review of this Sunset Villa. Click here for the villa listing on airbnb. ← Previous Post Xu Ting Restaurant: Mini Hotpot! ya lor! and my skin is very sensitive to begin with so i really scratched like crazy!